E-scooter parking on Figueroa Street in downtown Los Angeles. Photos by Joe Linton/Streetsblog L.A. Downtown L.A. has new e-scooter drop zones. The two observed by Streetsblog are on downtown L.A.’s crowded sidewalks. The one pictured above is on Figueroa Street at 7th Street, right outside the 7th Street Metro station, and next to the MyFigueroa’s bikeway. Ideally, L.A. could learn from Santa Monica and place some e-scooter parking in the street, so parked scooters don’t impede pedestrians. Santa Monica has sidewalk spots, too. LADOT is billing their dockless shared e-scooter/e-bike/bike-share device program as the largest in the U.S. – see their full press statement below. Shared device parking spot on the Figueroa Street sidewalk in downtown L.A. The Los Angeles Department of Transportation (LADOT) has begun to permit Dockless Mobility Providers (Providers) who applied to operate dockless scooters and bicycles in the City of Los Angeles. This is an expansion of the original Conditional Use Permit program launched in November 2018. To make sure people in Los Angeles have safe and comfortable transportation choices, LADOT created a pilot One-Year Permit to broaden the program and build on regulations for dockless mobility. Through this One-Year Permit Program, LADOT is working to ensure safety, comfort, and equity for all who wish to use dockless scooters and bikes. In this phase, LADOT is also introducing “Parking Zones” and the new ability to report issues related to dockless scooters and bicycles to MyLA311. 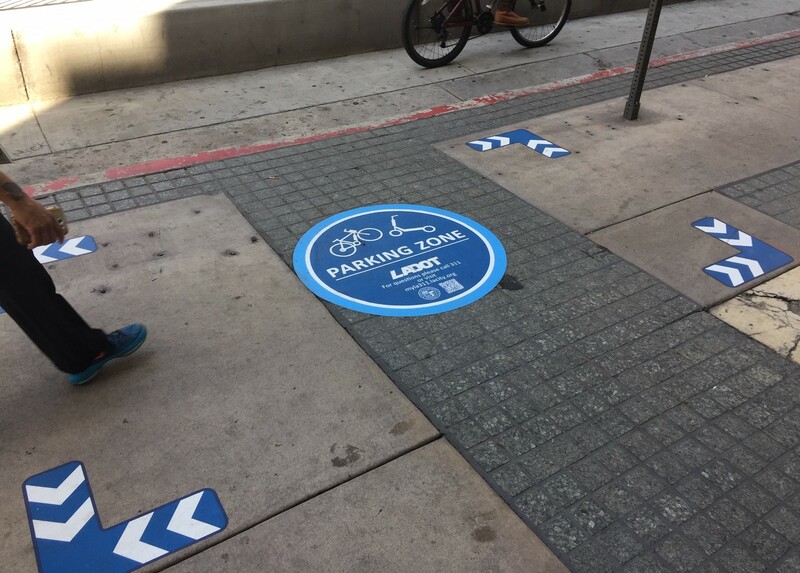 For people riding in Downtown Los Angeles, LADOT has created conveniently located Parking Zones. Users are encouraged to park scooters in these areas to help keep sidewalks clear and accessible for everyone. Providers have Parking Zone locations in their apps. LADOT plans to install additional parking zones over the coming months. Community members who want to install a parking zone in their area may work with their Council Office to identify potential locations. To obtain a One-Year Permit, Providers must meet a number of Council-directed requirements including insurance, liability, an equity plan, and a community engagement plan. The full application can be found here. Providers who applied for permits are required to comply by April 15. LADOT has taken a phased approach to permits for dockless scooter operations. In November 2018, LADOT released a Conditional Use Permit to test the terms of the permit requirements. This iterative approach helps LADOT take a thoughtful, rigorous, public approach to regulations. I like the basic idea of marked drop zones, but I worry that this is a prelude to eventually forcing users of dockless bikes/scooters to use these drop zones. Bird scooters removed from DTLA. Westside operations appear unchanged. Koretz, long opposed to actual pedestrian safety measures, is justifying a proposed e-scooter ban to protect pedestrians.